I remember it was a long long time ago since I pick up a book and read. I mean READ. Like I say gazillion times before and am repeating… I am a visual person. I look at pictures and books with no pictures practically bore me to sleep. 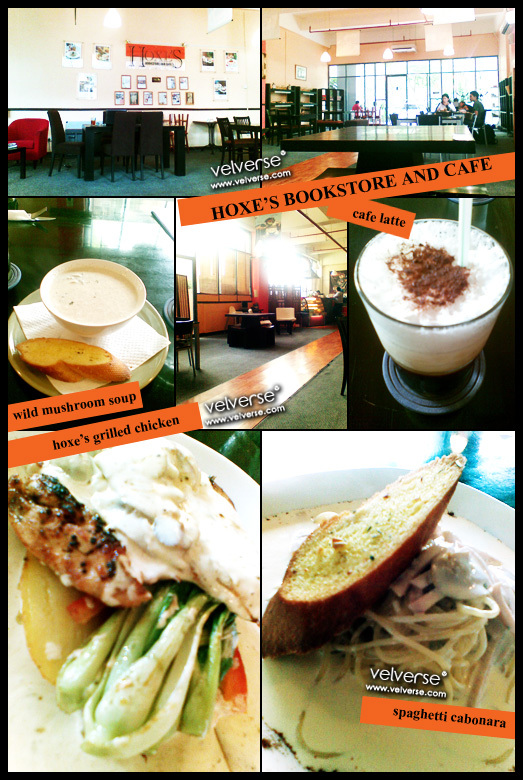 Yet, here I am, at Hoxe’s Bookstore and Cafe. Reason why am I here? Food of course. Many of my colleagues talk about their famous chicken rice and grilled chicken. So yes, and since it is like 50 steps away from my office… why not? Hoxe’s is really a nice and relaxing place for any group of people. If you love to read, there are many shelf full of books, if you can’t live without Internet… this is also a good place for you to get hooked up… if you love to eat… I must say they serve good food. If you love all of the above…. this place spells HEAVEN. Their Wild Mushroom Soup (RM5.70) is really creamy and thick. If you are thinking of campbell mushroom soup like… then forget it. The mushroom soup here have this rough texture due to the fact that they blend/finely chop the mushrooms. I must say… it’s really rich and filling. I took my colleague’s recommendation.. the Hoxe’s Grilled Chicken (RM15.60) and I must say… I never regret a single bit of it. It arrived on the table looking like a burger topped with creamy mushroom sauce. I then open it by layers and notice the bottom layer is actually potatoes… the middle layer is actually tomato slices and “siew bak choy” and the top layer… ooo la la… grilled chicken breast. Honestly… I think the dish is really delicious. Except I still find my first encounter of “siew bak choy” in western cruisine a little… er… how do I put it. WEIRD in a good way. It just never cross my mind. Not forgetting my Cafe Latte (RM5.00). Ah… what a lovely lunch. Now… I feel like sleeping in my office.